Peach Fuzz's debut is as sweet and satisfying as the pastel fruit. For Chicago's Peach Fuzz, the peach is a way of life. As evidenced by their Facebook page, Peach Fuzz is the pit at the center of a peach-based world where the “Nobel Peach Prize” exists (they won, by the way) and have introduced a peach-rock branch into the rock world. If you’re gonna choose a fruit as an ethos, the peach is the way to go. As far back as ancient Greece to Asian cultures today, peaches represent longevity. 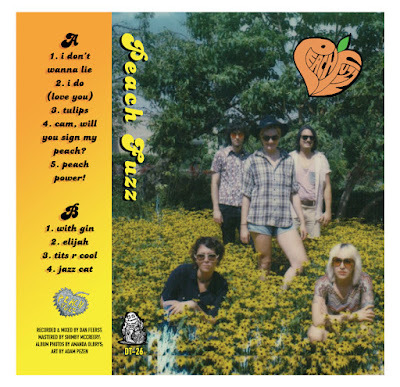 The nine songs on Peach Fuzz’ eponymous debut, released on the new Chicago-based tape label Dumpster Tapes, fuse a modern, wry sensibility with Nuggets-esque instrumentation. Song after song, Peach Fuzz taps into the fundamentals of good 'ol British Invasion rock ‘n roll. Whether a barn-burner or a slow-roller, the guitars are filthy, the rhythm section pronounced and without frills, and as a cohesive unit, the band jams with a tight immediacy. The vocals unify and splinter, playing off and layering over each other; your eardrums soak up their effortlessly catchy vocals while your limbs mimic the motions of theirs'. Midway through, the band addresses the peach-colored elephant in the room. On “Cam, Will You Sign My Peach?” they ask the titular question over low-key organ licks. Following that up is a tribute to the sweet fruit that they enjoy so much. Elsewhere lyrically, the first few tracks address unrequited and blooming love. “With Gin” is a liquor-fueled jam where they choose a night in with the clear alcoholic spirit over a night out with friends. “Elijah,” the best track, sounds like a hit song once-thought lost to time. The first half is poppy and floating with a killer chorus, but suddenly veers into a menacing jam before emerging back into the light. And that’s where Peach Fuzz succeeds: avoiding the pitfalls of handing nostalgia a microphone in a 2016 recording studio. At times, a guitar lick or a vocal melody will remind you of a song that may or may not actually exist. Bands like Peach Fuzz could coast on the comfort drawn from recognizing these classic rock 'n roll tropes and sounds, but Peach Fuzz brings too much heat to be a pleasant retread of the past. Listen to Peach Fuzz on bandcamp. Alex Stern is a freelance writer based in Philadelphia, PA. He enjoys Hemingway Daiquiris, Frasier, and lox. You can follow him on Twitter @alyman007, but he won't be offended if you don't.